Unique hand painted flower pot with blue and white flowers and green leaves and vines. This will show off your favorite plant to it's fullest potential. Add a bright splash of color to any area you put it. The design is painted halfway around the pot so it changes from any angle you view it. Change your decor just by turning the pot. This pot holds a 4" plant. 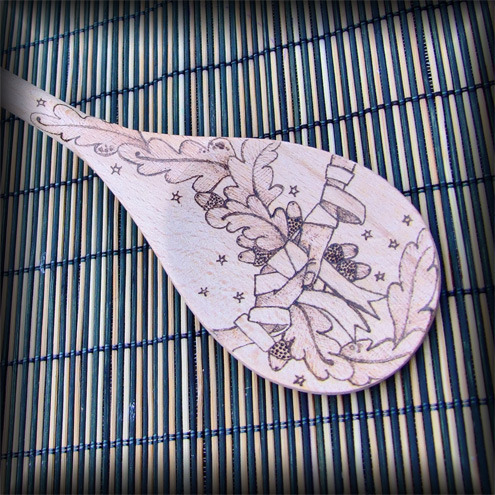 This is a listing for one wooden spoon decorated using pyrography. I have created a Handfasting design suitable for a Pagan / Wiccan etc Handfasting celebration. 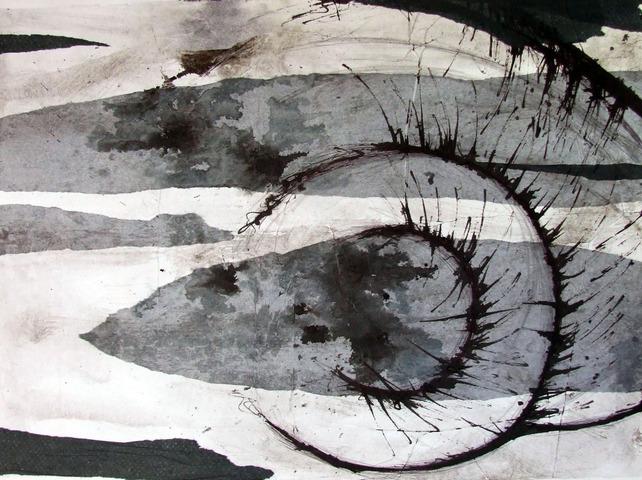 It pictures two hands entwined with ribbon and a splay of oak leaves and acorns. The reverse and handle are currently blank, ready for names and a date etc (please see other images) These can be added FOC. 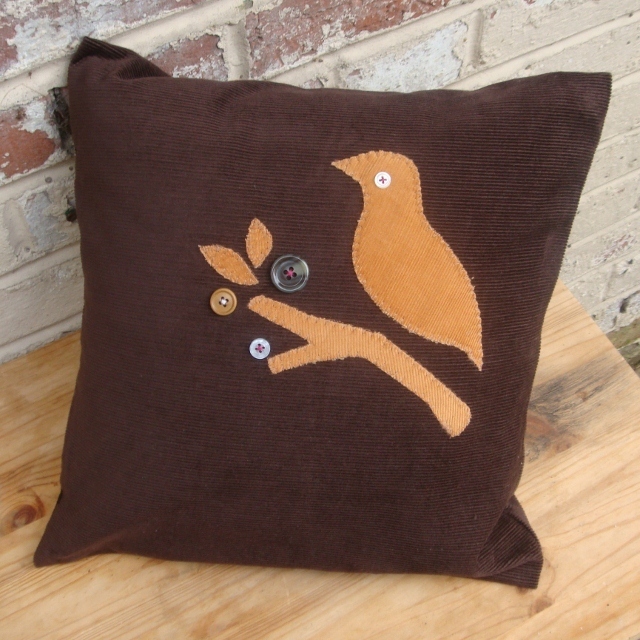 Vintage Fabric Deluxe RETRO Cushion with a Lime and Orange Horse Motif by AudreysCat. Vintage Fabric Deluxe patchwork and appliqued cushion, featuring 70s floral cottons and a horse design in shades of lime, yellow, orange and mustard. 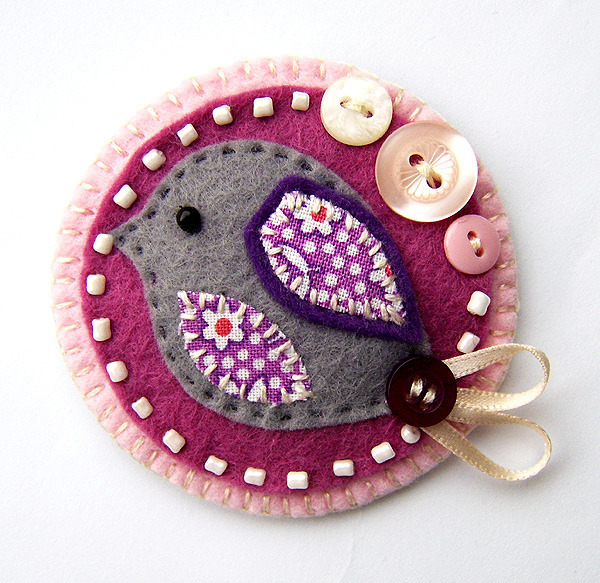 It features a floral fabric flower in the centre, mounted onto a grey felt circle. This brooch also features a cute little wooden button in the middle, to finish it all off nicely, with ribbon and stitching detail around. There is a metal brooch pin on the reverse side for easy attachment. A very pretty make up bag made up in the ever popular cupcakes fabric. It is trimmed with a lovely pink ribbon, cream lace, pink sequins and beads. The ribbon zip pull has a flower charm sewn onto it. The make up bag is lined in a blue cotton print and measures 26cm x 12cm. It is interlined for stability and is slightly padded. These cufflinks have been individually hand-made in shiny modern pewter. Due to the method of making,the links will vary slightly. Each link measures 2cm,0.75ins, across. Gift boxed. 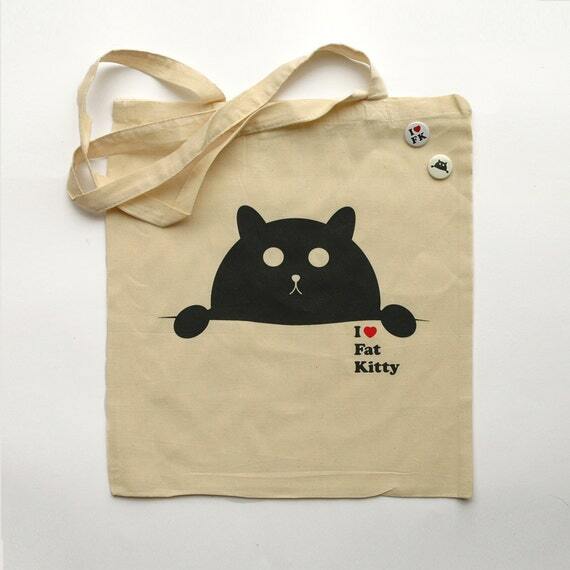 A perfect gift for a 10th anniversary. Each pewter piece has been individually made by hand (not cast) to my own original design. 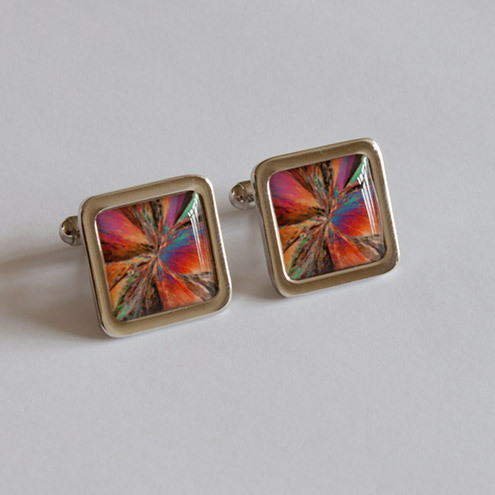 Nickel plated brass cufflinks printed with a microscope image of chemical crystals (citric acid) viewed by polarised light microscopy, covered with an acrylic dome. Presented in a gift box with a description of the image.